Most of the pottery I made in early 2015 was for a project at Jasper Ridge Biological Preserve, which is part of Stanford University. I began by digging clay at the preserve. It was actually a mixture of clay, rocks, roots, and sand, but by wetting and screening it I was able to collect a fine, dark, purplish-brown clay. This clay behaved reasonably well on the wheel for small pieces. It is a low-firing earthenware. The Jasper Ridge clay worked even better as a slip. Many of the pieces shown below were thrown with stoneware and then coated with the brown slip before they dried. I used sgraffito and other techniques for decoration before glazing. I also tried making a Jasper Ridge glaze by mixing the clay with ashes from some horsetail plants (Equisetum spp.) harvested nearby. It wasn't a consistent glaze by itself, but it added nice effects as a wash over other glazes. Some of the pieces I made for this project do not include material from the preserve; instead, they are inspired in some way by the preserve. 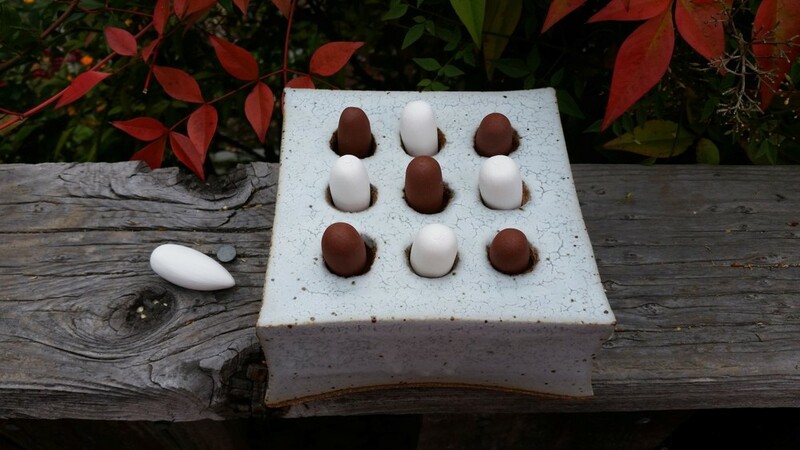 For example, I made several bird forms, a buckeye form, and an acorn woodpecker tic-tac-toe game. Click here for the full project report. Click on the images below for a larger view, and then mouse over for more information.